Victoria here. We have reached the spot in our Rhine Cruise where the river is the border between France and Germany. Today we toured the city of Strasbourg, home of the European parliament aand other EU institutions. So I shouldn’t have been surprised to find the first Place we encoutered was Place d’Austerlitz, where the Corsican general and his troops stopped on their way to the important battle of the same name, which thoroughly whipped the Austrians, IIRC. Hmmmm. But despite that little reminder, the town itself is charming — parts of it are very French and parts monumentally German. It has passed back and forth, as has its whole region of Alsace a number of times. Here is some of the French part. Many canals and the river Ill flow through and around the town center. We saw lots of storks which live at the top of specially trimmed trees and quite calmly stared at us from their large nests. Around the town I also saw evidence of the geese the region is famous for, but not a single one on the river — just swans and ducks. Of course the city is renowned for its ancient cathedral, combining Romanesque and Gothic features. It has a very complicated astrological clock that keeps the time, date, month, year, sign of the zodiac, lunar phases, etc.–all so old you would never guess they had the ability to fine tune such a huge instrument. Some of the windows are extremely old and quite beautiful. The large rose window was destroyed in WWII bombing, so it is a new creation. We finished off our stay with a lovely luncheon of French specialities: Quiche Lorraine and Flambe something, which was a very thin-crusted pizza aith local cheeses. And lovely wine from nearby vineyards. Tomorrow we cruise further south, which is upstream, since the Rhine flows from Switzerland (Lake Constanz) to the Niorth Sea. Our curise direction, from Amsterdam to Basel, has us moving south but upstream and the current is very very fast. The boat must have a good strong engine to push us along, while going the other way, you’d hardly have to use any power at all except to stay in the channels. Our off-boat trip will be to a section of the Black Forest. Then on Sunday morning Ed and I leave the Viking Sun and take the train to Paris where we merely change stations to return to London by Eurostar. I am busy making plans for a few last minute visits on the one day we have in London before going home. I believe that Kristine and Brooke are soon to be back home, so next week, we will try to fill you in on all our London activities (we didn’t have a computer until Ed arrived), and sift through our pictures and video. I hope some of them, at least, will be worth the wait. Research in London is really a redundant term for those of us who love the place and want to learn more about it. Just walking in the streets is a worthwhile experience…however, sometimes we want to dig deeper. I had that opportunity last week. 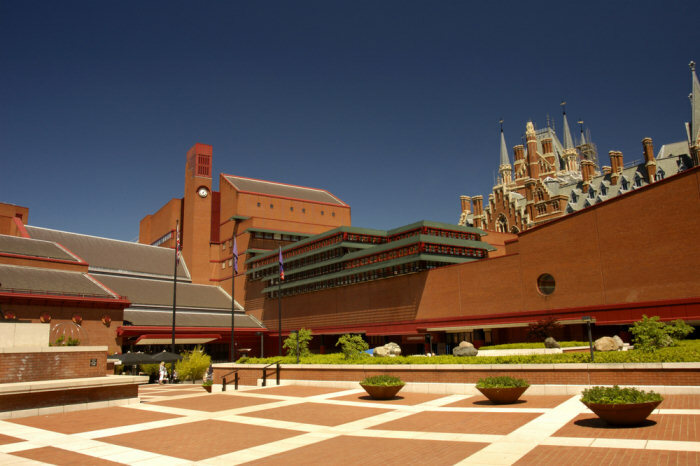 The British Library catalogue is easily accessible on line and you can set up a log-in account and save titles you are interested in looking at. It is all explained on their website and since I was able to manage it, I am sure others will find it user-friendly too. You can pre-register for a Reader’s Card on line, but once at the BL, you must go through a short interview and show a passport and a document with your home address — I used my Wisconsin driver’s license. If what you are interested in is easily accessible at other libraries, you might not be allowed to get the card. So be sure whatever you seek is relatively rare. I asked for two documents which I ‘d never seen in any other library catalogues. Once you have the Reader’s Card (it’s good for several months and can be renewed), you have to put all your belongings in locker except for your notepaper, pencil and/or computer, and maybe your wallet. Though they said they had clear plastic bags available to carry these things, they’d been all used when I was there, so I filled my pockets. This is the same system at many libraries to protect their collections — so if you want to carry much, have your own clear bag with you. Then you proceed to the room you had indicated in your on-line request as your reading room of choice (I picked Humanities 1), choose a seat and note the number, then present your Reader’s Card at the desk for your materials. In my case the two documents I had requested were only 21 and 12 pages long. I was amazed — although I am sure if I had read the catalogue info more carefully, I would have known. Anyway, I finished in about an hour and was most pleased with the experience. I had lunch in the library cafe, filled with other researchers. I could have requested something else to study, but they warn it takes up to 24 hours for many old things kept off-site, so being a bit jet-lagged, I decided to take a walk in the fresh air (as if there was any along Euston Road). 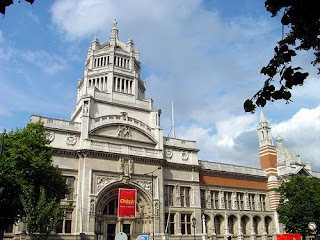 The next day I did research at Hertforshire Archives an hour north of London and also at the Vand A Museum Art Library, but I’ll give you the details of those experiences another time. Both have their catalogues on line — and will copy things for you for a small fee. We are recently back from the tour of charming Heidelberg and a delicious lunch of wurst and beer — that reminded us exactly of home in Milwaukee. Now I need a nap — cheers, Victoria, who is really sorry she can’t include any of her photos yet. Stay tuned. 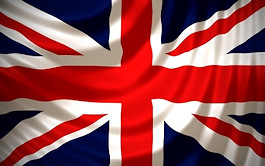 From Kristine: As you read this, Victoria will have arrived in London and I’ll be heading for New York in order to rendezvous with my daughter before our flight out to Heathrow late tomorrow night. There will be just a few changes to the blog while we’re away, one being that the blog may look a bit different since we won’t be able to shorten up the previous day’s posts as consistently as we do now. Also, while we’re away we’ve scheduled posts to run every other day, instead of every day as usual. Of course, we’ll also be randomly logging in via internet cafes to report on our progress and doings during our trip. 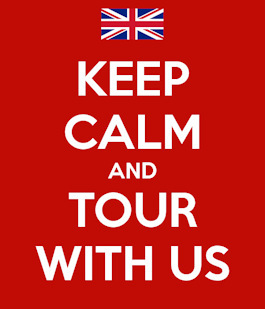 Really, I don’t know what I’ll do without blogging everyday . . . . . .
We’ve made a few adjustments to our itinerary. 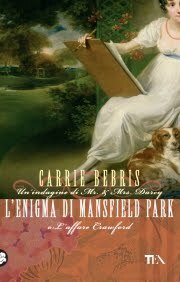 For instance, we are now having dinner at the Grenadier Pub on Sunday evening and are going to be joined by Carrie Bebris, author of the Mr. and Mrs. Darcy mystery series. 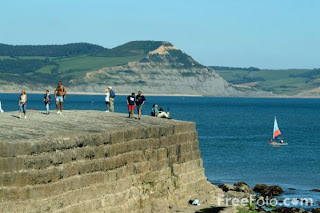 Carrie is doing some last minute research on her next book, which will be based on the characters from Jane Austen’s Persuasion, and we are eager to hear about her visit to Lyme Regis, below. 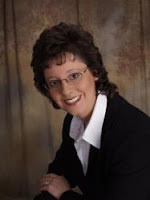 From Victoria: Carrie now lives in Ohio, but we are long-time friends from her days in Wisconsin where we collaborated on projects for the Wisconsin Romance Writers and the Jane Austen Society Wisconsin branch. We were roommates last October in Philadelphia at the JASNA-AGM. Above is the French translation of Carrie’s book Intrigue at Highbury. After her dalliance in France, Kristine might try to read this version. How about it, Kristine???? Our dinner will be at the Grenadier Pub. We hope we get in a lot of chatting before the ghosts arrive to divert us. 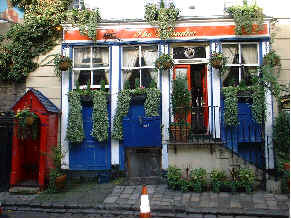 You can read Kristine’s account of her previous visit to the Pub here. 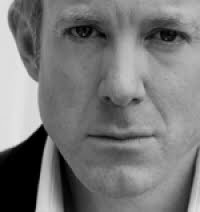 We’ll also be meeting author/actor Ian Kelly at the London Library, where he’s been working on his next project, the bio of, as Ian told us, “another Georgian bad boy.” We’ll then be going on to tea together, so you can bet we’ll be trying to pin Ian down on the subject of his next book. If we’re not sworn to secrecy, we’ll tell you all about it. If all goes according to Plan, I will have completed two days in London by now, the first spent at the British Library and the second spent at the Hertfordshire Archives in Hertford, a short train ride north of the City. I have reserved materials at both places and at the National Art Library at the Victoria and Albert Museum, left. 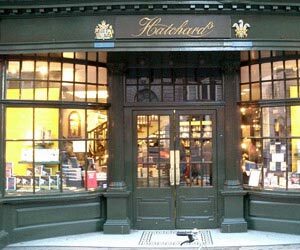 Among the other wonderful places Kristine and I intend to drop by is Hatchards Bookstore, in place at 187 Piccadilly since 1797. Just breathing the air here is a delight. Not to mention the many antiquarian book shops and print sellers we will haunt. We promise to share all the details with you eventually. Here’s a picture I took of a display window in Fortnum and Mason, nearby on Piccadilly in May 2009 when my husband and I were staying just half a block away at the Cavendish Hotel, corner of Jermyn and Duke Streets. Though the Cavendish is a high rise hotel, it sits on the site of the 19th Century hotel run by Rosa Lewis. She is famous as the fictionalized Louisa Trotter (played by Gemma Jones) in the BBC-PBS series The Duchess of Duke Street, one of my favorites from Masterpiece Theatre. Below is the statue of Beau Brummell, fashion arbiter, which stands near the Cavendish on Jermyn Street, home of many gentleman’s haberdasheries. Below, another sculpture on the pavement, this one of FDR and Sir Winston Churchill having a conversation on Bond Street. It was unveiled in 1995 by Princess Margaret; the sculptor is Lawrence Holofcener. The statue commemorates 50 years of peace since WWII ended. (Well, shall we say, relative peace?) Note the shiny arms and knees on the inside halves of the figures — the result of so many people sitting between the two leaders to have their picture taken. This was one of the intentions of the sculpture and it has worked a treat. Both Kristine and I are eager to find all sorts of new experiences as well as to savor again some of our old favorites. Bon Voyage indeed! 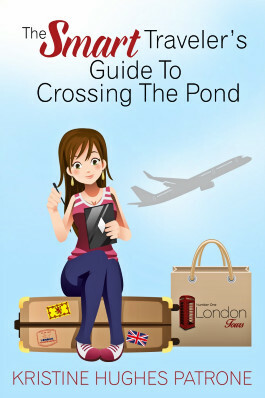 Author Kristine HughesPosted on June 10, 2010 Categories Kristine Hughes, London and Waterloo Tour, Uncategorized, Victoria Hinshaw1 Comment on Bon Voyage! Victoria here. On two occasions, I have had the privilege of visiting the Garden Museum in London. It is located in a small building, St. Mary’s Church before it was de-consecreated, and stands next to Lambeth Palace almost on the Thames. 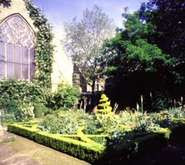 The small knot garden was designed by the dowager Marchioness of Salisbury, a well known and expert gardener. It occupies part of the graveyard of the former church and includes the graves of John Tradescant, one of history’s first and most important plant collector from distant shores. Another large memorial is for Captain William Bligh, of Mutiny on the Bounty fame. The interior of the church has been adapted with a prize-winning plan to offer more space for displays without compromising the old walls and windows of the 14th century building. 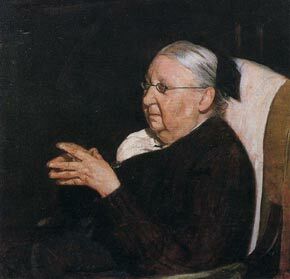 My first visit was for an exhibition on Gertrude Jekyll (1843-1932), one of the gardening world’s most distinguished practitioners. Of course, everyone immediately wants to know if she had anything to do with Robert Louis Stevenson’s Dr. Jekyll and Mr. Hyde. The answer is maybe. Her brother was a friend of the author. But I have always heard Miss Jekyll’s last name pronounced as GEE-kull. 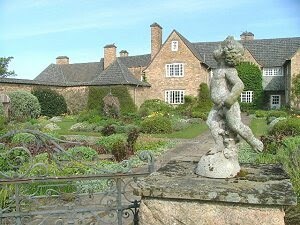 Gertrude Jekyll is best known for the country gardens she designed, many in association with the distinguished architect Edward Lutyens (1869-1944). They collaborated on the famous house Greywalls, 1901, in Gullane, Scotland, now known as the club-hotel at Muirfield Golf course on the Firth of Forth, near Edinburgh, sometimes home of the British Open Golf Tournament. Greywalls was often the vacation retreat of Georgette Heyer, one of my favorite authors. 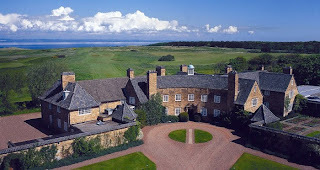 I was visiting in Dirleton Scotland, a village just down the road, when a group of us decided to have tea in the Jekyll Gardens at Greywalls. Despite the emphasis on visitors interested in the golf course, they welcomed us and fed us a lovely tea. Jekyll designed her gardens in “rooms” of various color combinations and design themes. 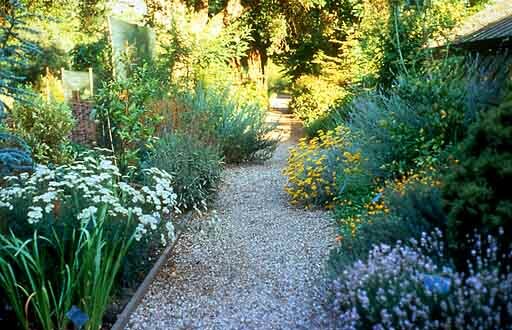 I suppose we think of her herbaceous borders more than any other specific technique, but she never stopped experimenting with new and different arrangements of color, texture and scent. The official site is here. 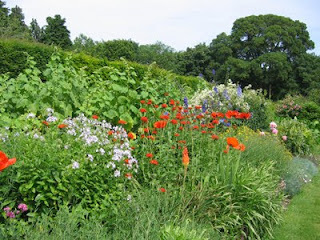 You can learn even more about her here where there is information about her own garden at her house Munstead in Surrey. As long as we are talking gardens here, I will drop in a picture of the Chelsea Physick Garden. 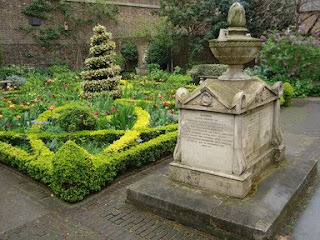 This is one of the most interesting places in London if you love gardens. I can’t pretend to have visited here long enough to know it well, but someday, I’ll go back and spend more time. Isn’t that always the way when visiting places we love? Tempus fugit. Now that I am almost on my way to England, I will post about one of my favorite house visits from past trips. Saltram House is near Plymouth in Devon. Saltram’s first records indicate the Bagg family built a large Tudor house on the site in the 16th century. After the Civil War, the Carteret family acquired the property and did some remodeling before Parliament allowed them to sell a Crown-granted property to George Parker in 1712. His daughter-in-law, Lady Catherine Parker and her husband John rebuilt sections of the house and filled their addition with decorations in the rococo style. The architect and artisans are unknown though Lady Catherine herself is said to have been the primary designer. Right, a portrait of Mrs. John Parker by Sir Joshua Reynolds, c. 1770-72. A central staircase with a glass ceiling was created from the traditional Tudor courtyard in the center of the squarish house. Enclosing the courtyard was a relatively new idea at the time, providing bright light to the center of the house and allowing for a grand staircase. In the photo from the 1995 film of Jane Austen’s Sense and Sensibility, Fanny Dashwood peers down at Elinor and Edward, and she thoroughly disapproves of the budding romance. John II, who became Lord Boringdon in 1784, brought in Robert Adam to re-design unfinished rooms, particularly the Saloon, even now virtually unchanged from the master’s touch. 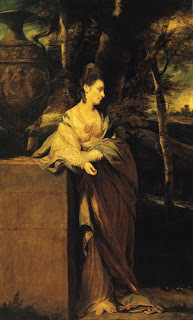 Lord Boringdon was a close friend of Sir Joshua Reynolds, who assisted in the acquisition of Saltram’s fine collection of art, including ten of Reynolds’ works. 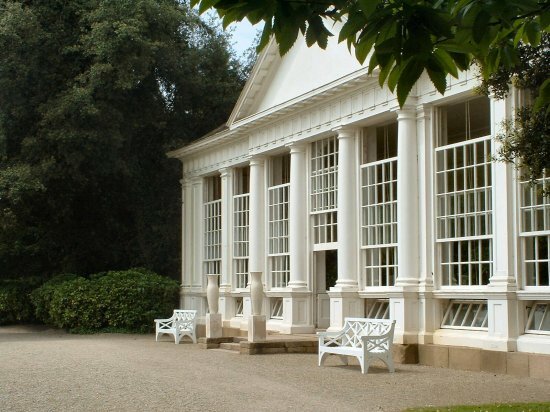 Several paintings by Angelica Kauffman also hang at Saltram. She often worked closely with Robert Adam. 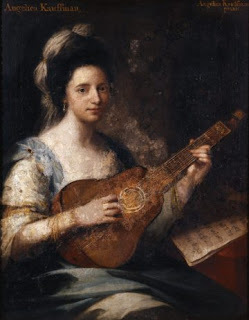 Left is a self-portrait of Ms. Kaufmann from Saltram. industrial environment. 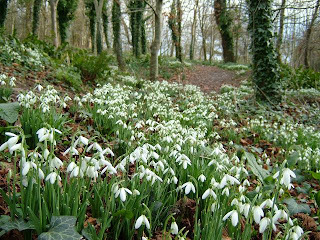 Below, snowdrops in early spring at Saltram. John Parker III, at age 16, became Lord Boringdon upon the death of his father in 1788; he was named first Earl of Morley in 1815. After some years on the Grand Tour, he followed his forefathers by representing the area in Parliament and as a leader in local affairs. 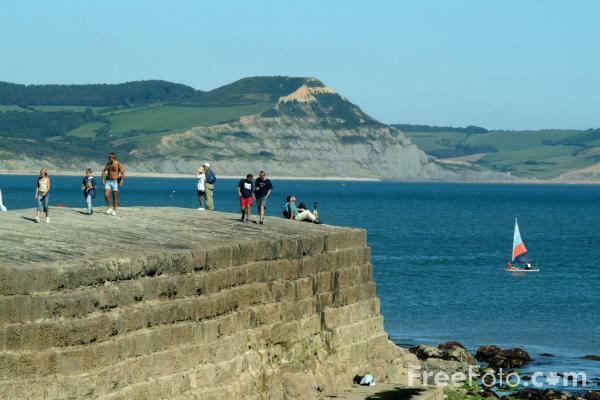 But his costly engineering properties for the surrounding region brought debts requiring the family to let the house from 1861 to 1894. 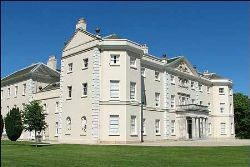 The third Earl, also a politician and statesman, and his son lived at Saltram until 1951 when the house, its contents and 290 acres of park were given to the nation in lieu of death taxes and taken over by the National Trust. 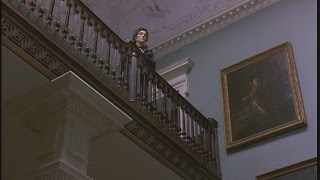 As I already mentioned, Saltram house played the Role of the Norland estate in the 1995 film Sense and Sensibility, adapted by Emma Thompson, which is superior, in my opinion, to later versions. The Red Velvet Drawing Room, from which Elinor weepily watches Marianne playing the pianoforte in the Saloon and is comforted by Edward, has several noteworthy features. Many of the gilded chairs retain their original red velvet seats. The guidebook compliments the care of the housekeepers, who kept extra covers in place when the family was not entertaining. An old inventory lists a red and white feather duster as part of the room’s furnishings, and indicates that at least one of the Countesses dusted her precious porcelains herself. 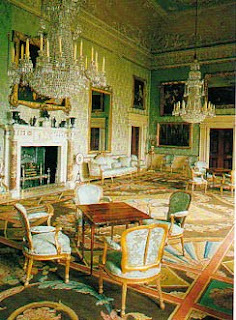 A pierced gilded fillet surrounds the fireplace and doors, running horizontally along the chair rail, quite evident in the film. While very elegant, this is a comfortable room that would put its occupants at their ease. Kauffmann. 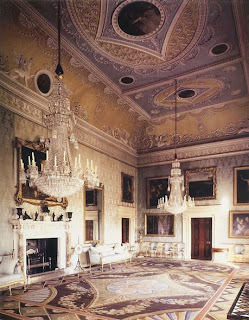 The two elaborate 19th century chandeliers now hanging in the saloon were tied out of view for the film. Of interest to the modern visitor is the Great Kitchen containing an open range dating from 1810. A collection of more than 600 copper pans and utensils is on display. In 1788, the kitchen staff included a cook, kitchen maid, scullery maid and still-room maid, in addition to other indoor servants: a governess, the housekeeper, two housemaids and the butler’s staff of an underbutler, two footmen and a brewer. In 1811, each bedroom was provided with a copper can of hot water at least twice a day. The grounds contain several gardens, an orangery (right), follies, stables and a chapel. Parts of the estate are being preserved as wildflower and wildlife habitats. While wandering the lawns admiring the view of the river Plym or the sheep and cattle across the ha-ha, only the faint sounds of the nearby motorway might remind the visitor of the 21st century. 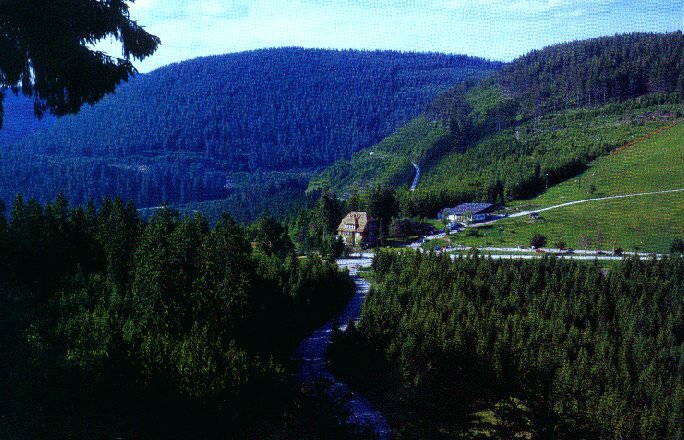 But a careful reading of the guide book reveals that the ha-ha was constructed in 1963; until then, the cattle grazed right up to the buildings. And, as always in NT properties, the temptations of the well-stocked gift shop and the delights of the tea room are features I love, though they weren’t available to early 19th century guests.